This lentil and pasta salad goes well as a side or a main dish. The light lemon touch adds an expressive flavor that keeps the dish tasting light as well as feeling light. As a main dish it is very satisfying, especially when served with a crusty bread and some tomato wedges and a side of fresh fruit. Lentils and pasta make a great combination, especially in this case. The lentils provide a lot of nutrition, low fat and about 9 grams of protein per 1/2 cup serving. They are also great for dietary fiber, folic acid and a whole passel of other vitamins and minerals. 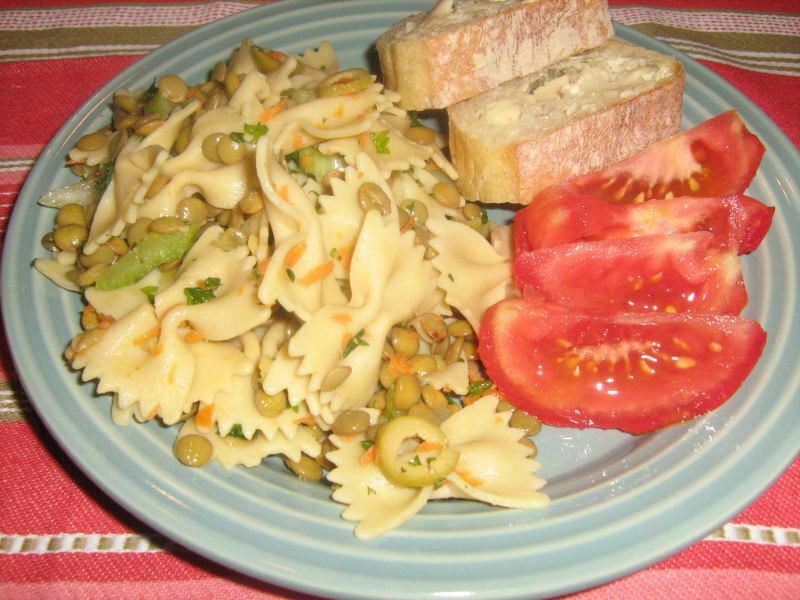 Try the Lentil and Pasta Salad this weekend! Combine all of the dressing ingredients in a small bowl and whisk until well blended. Refrigerate dressing until salad is prepared. Add lentils and 2 cups of water to a medium saucepan and bring to a boil. Reduce the heat, cover and simmer for about 20 minutes. The lentils should be tender but not mushy. Drain and rinse with cold water. Cook the pasta according to package directions, Drain and rinse with cold water and place in a large bowl. Add the lentils and the remaining salad ingredients. Pour the dressing over the salad and toss gently to completely coat. Serve with a crusty bread and tomato wedges with a side of fresh fruit.